Cochrane Kidney and Transplant (CKT) develop and maintain a database known as the Cochrane Kidney and Transplant Register of Studies. It is a database of randomised controlled trials in kidney disease that reflects the scope of our Group. It has been developed primarily to support authors writing systematic reviews, although it is also a unique and comprehensive resource for the nephrology community, providing support for the development of quality evidence-based practice and research by kidney physicians, nurses, researchers, policy makers, other health-related professionals, and consumers. All reports are screened for relevance in terms of the scope of Cochrane Kidney and Transplant & study design (i.e randomised controlled trial (RCT) or quasi-randomised controlled trial (CCT)). The full-text of all potential reports is obtained. Each report is checked against MeerKat to see if the report is part of a study that already exists. If so, the report is added to that study in MeerKat. If the report is a new study, a new study is created and the reference added to that study. Individual reports can be linked to more than 1 study. Studies and reports are coded with interventions, health care conditions and a review number (i.e. a review that is registered or published with CKT) to which the study may be relevant. A potential review title may also be added. 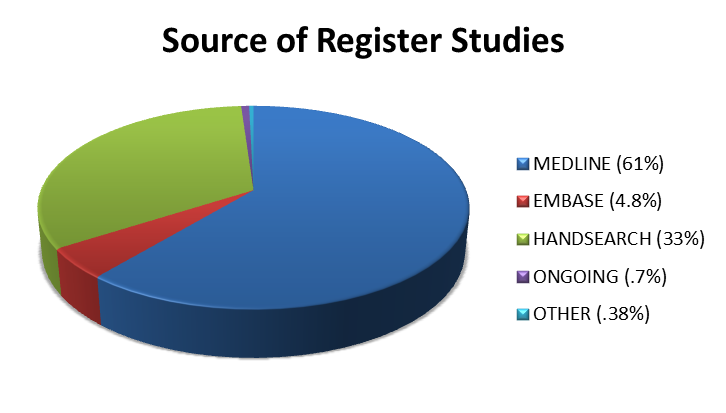 Study registration IDs (e.g. NCT001123456) are also obtained and added where available. 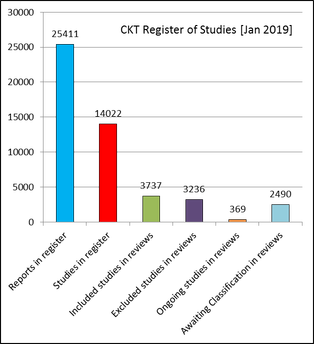 The CKT Register of Studies contains 25411 reports of 14022 studies. As of January 2019, 27% (n=3737) of the studies in the CKT Register of Studies (n=14022) are Included Studies in CKT systematic reviews. Another 18% (n=2490) of studies are Awaiting Classification in CKT systematic reviews currently in production.